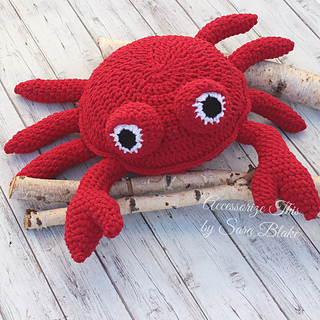 1 Round Double Crochet = 2.25"
“Pinch” the Crab is a clever crustacean! Perfect for home & nursery décor. Measuring approximately 2 feet, made with Bernat Blanket Bright Super Bulky yarn making him soft, cuddly and quick to work up. Scrap worsted weight yarn in black and white for eyes. Please feel free to sell any finished items made using this pattern, but please link back to this pattern and reference myself as the designer. All photographs on this page and in the pattern are copyright protected and cannot be used to sell or promote your items. There are no returns or refunds for pattern sales. All sales are final.